Embedded in bark, the Emerald Ash Borer gleams like the gem. 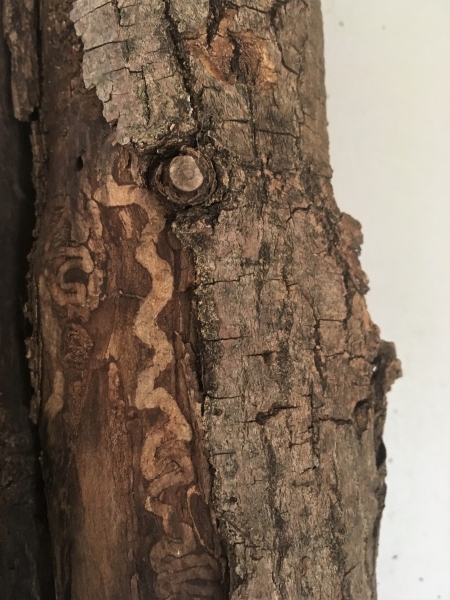 Adult females lay their eggs in the cracks and crevices of ash trees, and once hatched, larvae, cream-colored and as thin as filament, gnaw into the deeper layers. They chisel fatal curlicues that disrupt the flow of nutrients. A few months later, the life cycle begins again, and the adults emerge through a D-shaped hole in the bark. By that time, the tree is dying or dead of starvation. Millions of acres of ash trees – in Michigan, where the invasive pest arrived, after hitchhiking on shipping crates from China, and nearly two-dozen other states, including North Carolina — have succumbed to the destruction. But the borer has had help – from us. The insects’ journey and survival have been assisted by human-led climate change, whose impacts, such as drought and wildfire, have stressed America’s forests, leaving them vulnerable to attack. The borer, in miniature, illustrates a global crisis. Scientists have described the crisis – no longer a far-fetched figment of the future, but one that is happening now — in the Fourth National Climate Assessment, a congressionally mandated report. While a National Oceanic and Atmospheric Administration (NOAA) official emphasized the content had “no external interference,” the timing was suspect. Some suggested the Trump administration tried to bury the news by releasing it at 2 p.m. last Friday, on a holiday weekend when few people were paying attention. Media received the embargoed document an hour prior, hardly enough time to digest even the executive summary. On a media conference call, NOAA spokespersons refused to answer questions about the timing of the report’s release. “We encourage you to focus on the content,” NOAA spokesperson Monica Allen said. That is one of the questions posed to hundreds of scientists who contributed to the reports. Well, it turns out, there’s a lot. At 1,700 pages, the document depicts the cataclysmic effects of a changing climate on coasts, forests, infrastructure, water, energy supplies, agriculture, economy and public health. It calls for us to mitigate as much damage as possible, as well as adapt. When applied to North Carolina, the report’s recommendations contradict many state laws and policies enacted over the past decade. Despite the state’s well-documented climatic and economic vulnerabilities, the legislature has passed these laws even while hurricanes and floods, droughts and wildfires have inflicted billions of dollars in damage on property and the economy. and heat-related illness, asthma, respiratory disorders and mental health crises, particularly among low-income communities and people of color, are all connected with these unnatural disasters. Although Gov. Roy Cooper’s executive order on climate change is a good first step, lawmakers have placed stop sticks on the road to sustainability. The governor’s order says the state “will strive to reduce greenhouse gas levels by 40 percent by 2025,” yet an 18-month moratorium on wind energy is in place until Dec. 31 – and could be extended when the legislature convenes to continue the short session tomorrow. “Today, the largest uncertainty in projecting future climate conditions is the level of greenhouse gas emissions going forward,” the report reads. Transportation contributes significantly to the causes of climate change, according to the report. In 2016, the transportation sector became the top contributor to U.S. greenhouse gas emissions. Yet, state and federal transportation officials plan to widen highways, such as I-85/I-40, or build new ones. According to its own documents, the Complete 540 project, a toll road in southern Wake County, a $2.2 billion project, would add more traffic to existing streets. 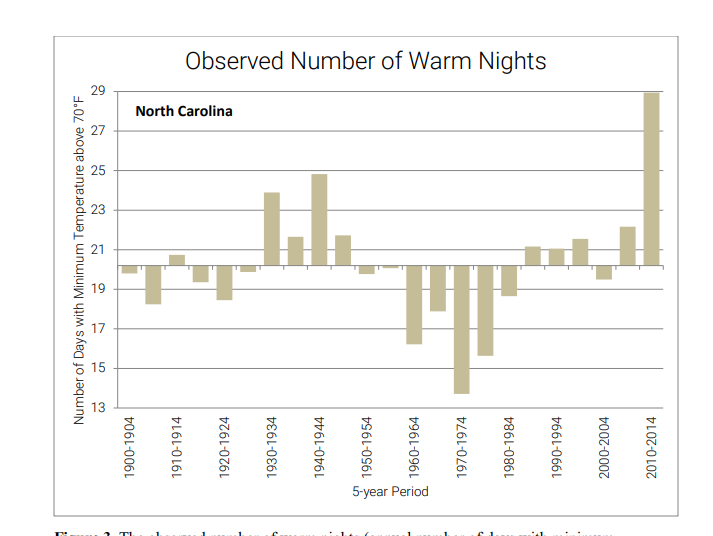 While Wake County’s population is growing, some small towns in eastern North Carolina, already losing residents for economic reasons, are also experiencing population declines because of climate change. These people are, in effect, the state’s first wave of climate refugees. After Hurricane Florence, the state Water Infrastructure Authority met to discuss the economic plight of water and sewer systems in these marginalized areas. Not only do these “distressed systems,” as they’re called, including Cerro Gordo, Ahoskie and Saint Pauls, have aging and failing infrastructure, they lack the customer base to raise money to fix it. Now, some residents are bailing on their hometowns and heading farther inland. The very identity and culture of the coast is also endangered. In many coastal areas, development ordinances and ill-advised beach nourishment and protection projects still encourage construction as close to the ocean as possible. In Pine Knoll Shores, already built to the max, the town’s last large tract of coastal forest, directly across the road from the N.C. Aquarium, has been sold for development. In addition to controlling floodwaters and filtering pollutants, forests store carbon dioxide. “Ensuring the continuing health of forest ecosystems and, where desired and feasible, keeping forestland in forest cover are key challenges for society,” reads the report. But the wood pellet industry, which chops up North Carolina trees to be burned as fuel overseas, is contributing to the release, not the sequestration of carbon. The fossil-fuel footprint of the wood pellet industry is enormous: from timbering, trucking, operating the plants, transporting by train and ship, to the final step of burning the pellets instead of coal. Nonetheless, the state Department of Environmental Quality is considering whether to grant an air quality permit for the Enviva wood pellets plant in Hamlet, the company’s fourth in North Carolina. North Carolina is adapting in small ways. The Department of Agriculture is funding another round of buyouts of industrialized hog operations in the 100-year flood plain. Coastal communities are developing resiliency and adaptation plans. In fact, North Carolina needs to do more — and quickly.